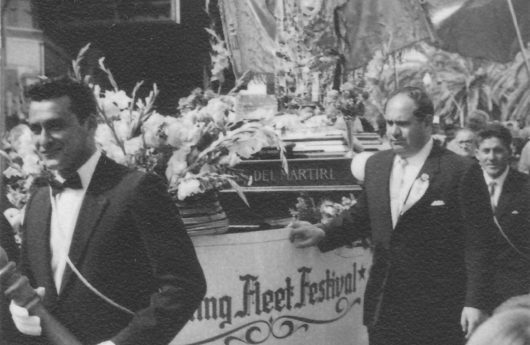 In Western Australia, the Italian community established a number of festas to display their devotion and affection to saints including Saint Anthony, Saint Joseph and Saint Leo, but none of the festas are as well-known or attracts as many people as “The Blessing of The Fleet” in Fremantle. While the port city of Fremantle is now home to a number of Italian migrants from various parts of Italy, the first members of the Italian community were mostly fishermen from Capo d’Orlando (Sicily), the Aeolian Islands and Molfetta (Puglia). These fishermen were accustomed to grand processions and religious celebrations in their hometowns, in which the local priest would bless their fleet to ensure a safe and prosperous fishing season. The first fishermen arrived in the early 1900’s but it was not until 1948 that those from Molfetta organised the first Blessing of the Fleet celebration. In 1954 the Molfettesi were joined by their Sicilian counterparts and since then the “Madonna di Capo d’Orlando” and “Madonna dei Martiri”, Patron Saint of Molfetta, have been affectionately paraded around the streets of Fremantle on the last Sunday of every October. The Blessing of the Fleet is a spectacle to behold. It is not every day that one witnesses a medieval tradition in a hipster city such as Fremantle. Children and adults are dressed in traditional costumes, Italian music serenading the town. A group of women carry the silver Madonna di Capo d’Orlando, and the men carry the Madonna dei Martiri from the historic St. Patrick’s Basilica to the fishing harbour. While the festa attracts thousands of spectators each year, committee members have allowed it to become bigger and bolder to ensure its longevity. This year The Blessing of the Fleet collaborated with Nella Fitzgerald, festival director of Little Italy By The Sea, a weekend-long street festival that brought Italian flair back to the historic town of Fremantle, which was once considered a Little Italy of Western Australia. The festival director hopes that having “Little Italy By The Sea” with “The Blessing of The Fleet” will encourage young Italo-Australians to embrace their heritage and the traditions of their ancestors. Whilst interest in The Blessing of the Fleet grew considerably this year, Fitzgerald and the Blessing of the Fleet committee have ambitious plans for 2018 when the festa will celebrate its 70th anniversary. “We want to make ‘The Blessing of the Fleet’ and the ‘Little Italy By the Sea’ the biggest Italian cultural Festival in the Southern Hemisphere by 2018,” says Fitzgerald. With a renewed interest in Italian culture, a new wave of Italian migration and the two teams managing to launch an incredible inaugural festival, it seems the prayers to ensure the festa’s longevity have been answered.